I'm sorry, rest of the country. While you were enduring frigid sub-zero temperatures the past few days, we were basking in glorious upper 20s heat. Not normally a temperature I'd consider bragging about, but given that when we talked to my in-laws in Minnesota this past Sunday the daytime high was still in the teens below zero we're feeling like we're living in a tropical resort in comparison. I do have to say, though, from someone who lived in areas with extreme winters for most of my life, there are upsides to extreme cold. Basically those upsides all have to do with hibernating, which I really enjoy. Curling up with some hot chocolate and watching a movie when the house is making the weird creaking noises that happen when it gets way below zero is my idea of a relaxing afternoon. And there is something about knowing that it is cold outside that makes me want to bake homemade bread and chocolate chip cookies. This chicken and rice bake goes along perfectly with hibernation days. It is simple to make and is as warm and comforting as a bowl of chicken soup. 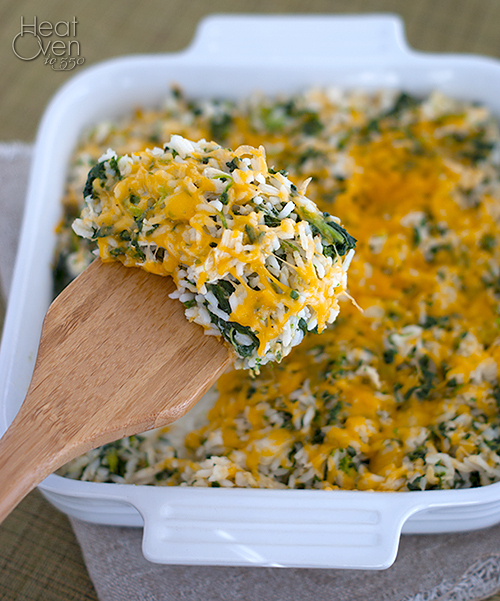 I love the flavor of the spinach with the chicken, rice and cheddar cheese. The dash of hot sauce adds the perfect little amount of heat and touch of flavor. 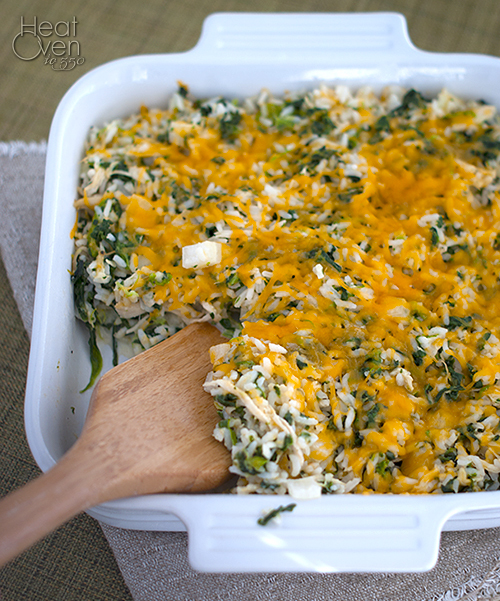 This is a great recipe for using up leftovers - leftover rice, leftover chicken, even leftover spinach if you have some fresh spinach that needs to be used up and want to substitute it for the frozen spinach. It is a versatile, easy, delicious dish that you'll find yourself making again and again. Heat oven to 350 degrees. In a medium mixing bowl, combine rice, spinach, 1 cup of the shredded cheese, chicken, milk, salt, tabasco sauce and pepper, stirring to mix thoroughly. Add rice mixture to a greased 8x8 baking pan or 1 1/2 quart casserole dish and cover with foil. Bake dish 35 minutes, or until hot and bubbly. Remove foil, sprinkle with remaining 1/2 cup cheddar cheese and cook until melted, an additional 5-10 minutes. this looks really delicious. Ya, the house was a creaking away for the past two days...and there was frost on the INSIDE of my kitchen baseboards yesterday morning. Brrrrrrr. 20's IS tropical! This recipe does sound completely warm and comforting after several days of single digit temps down here. I usually have extra chicken and spinach sitting in my fridge so I love that I can easily whip this dish up now! Same here in Florida. I have most ingredients and will pick up the cheddar after I drop my 17 y.o. toy poodle off at the groomer.